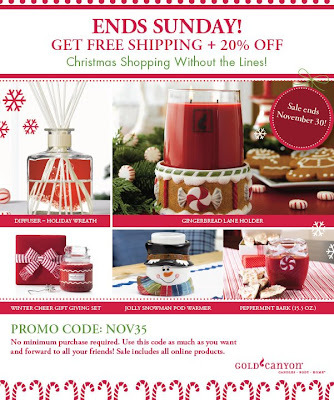 Gold Canyon Candles 20% off + free shipping! Target has 1 lb. heads of fresh broccoli and cauliflower on sale for $1.33 this week. Use this $1/1 coupon here to get them for $0.33 each! You can print and use this coupon as many times as you'd like. You can freeze your veggies or use them for baby food! You can find more coupons for Target here, here and here. Don't forget to use these coupons along with your manufacturer's coupons for even more savings. Limited Too Sale- B1G1 Free Sitewide plus an extra 30% off now thru 11/28! Plus, earn $80.00 in TooBucks for every $50 that you spend! Plus if you enter code 758 at checkout you will receive an additional 30% off! Shipping is only $5 when you spend $75.00, which is even more appealing! To add to the deal, you can earn Too Bucks right now too, and they are offering bonus Too Bucks, so for every $50 you spend, you earn $80 to use later! Sounds like a great deal to me! If you aren't intrested in the clothing, even with the sale and promos, they Limited Too also carries WebKinz, hair accessories, cd's, cameras, cd players, MP3 Players etc and it looks like they are included in this sale! Here are a couple of extra codes as well! The only things not included are Nintendo DS, Wii and their games. Shelf Stable Milk (I almost didn't believe it) 12/32oz are only $13.50/case. This is the SAME milk you get at the store, just boiled at a high temp so all bacteria is killed. It is stored like soy/rice milk. Long story, but this tastes and is just like your regular milk. It is your regular milk! No refrigeration necessary. I was skeptical, but I tried it and loved it. Whole, 2%, 1%, skim, chocolate plus many other flavors. Also comes in cases of "juice box" sized cartons. Shelf Stable Whipping Cream/Butter I know, it's almost too good to be true! But if you are living off of your year supply and you are going to be making home made bread, you are going to want butter to go with it! Hard Goods like a grain mill, home canning kit, sun oven, screens etc. Honey All kinds. By the pound, gallon, oz. Spices & Seasonings All kinds by the pound. Freeze Dried/Dehydrated Foods YOU NAME IT, it's there! And it's good, and priced great! Water Barrels - for $20.00! Lots of other canning supplies for a great price! Their blog has all of the different order forms/price sheets for products available (Too many for me to list) as well as food storage charts and other useful information for food storage. Going to their show got me really motivated into the thought that food storage doesn't have to be boring, but there are a lot of GREAT products out there (and at reasonable prices) that your family WILL eat and enjoy. If you are interested in hosting a show, they offer a 10% discount to the Hostess. (no sales by guests are required) Plus, they bring some of the products for you to taste and try out. They also had GREAT tips on how to make cheese, eggs and other products shelf stable as well as tons of food storage ideas. If you are interested in ordering items, all you have to do is email them and they will get in touch with you and do the rest! Cheeses can be stored by dipping them in melted paraffin. (Available on food canning isles at grocery stores and online stores) Remove any wrapping from the cheese. Melt the paraffin in an old pan. Dip the cheese in the melted stuff or get a paint brush and paint the paraffin on the cheese. Allow the paraffin to dry completely, and dip again. After about 4 coats of paraffin, you may add a layer of cheese cloth for extra protection. Continue dipping and drying until the paraffin has formed a smooth, thick, bubble free surface. Store cheeses that have been coated in paraffin in the coolest spot you can find, as in a cellar or unheated room. Cheeses that have been stored this way will last a very long time, almost indefinitely. If the paraffin ever gets a crack or blister, re-coat it with melted paraffin. Someone posted on a HCW forum that the Jeni-O turkey is advertised in-store for $0.38/lb but when they bought it, it came out to 0.21/lb. It was a (near) 15 lb turkey and they got it for $3.26. Anyone else seeing this deal at their Fry's? Now thru November 30th Sonic has .25c ice cream cones and corn dogs! My SIL was at the Sonic in QC when she saw this. It is part of their "cornucopia of savings". Let us know if your Sonic isn't doing this. Go HERE to print yours! Snapfish is offering 20% off of all of their cards, calendars and photo books. OR- Shutterfly is having a Black Friday/Cyber Monday sale. Get free shipping and up to 50% off items on your order between 11/25 and 12/3. You should also be able to get a free 8x10 collage poster with the promo code AF72-SAVE (through 12/2). Other items available through Snapfish are things like: mugs, mouse pads, photo ornaments, posters etc. The Promo Code for this is: PHOTO241. You can only use the promo code once per email address. Last year for Christmas we did the smaller photo books for Grandparents with the 2-for-1 deal from MyPublisher and they loved them! Page A28 has a small Bashas' ad with some small Q's that can also be used at Fry's. They are also advertising their Norbest Turkeys at 0.43/lb. Remember, Bashas' also has their "Super Double" coupons where they double all coupons, even $1.00 Q's will be doubled to $2.00. They will not double any coupons that have a face value over $1.00. Page C16 (my husband's beloved sports section) has an Albertson's ad. Only one Q for B1G2 on Oscar Mayer Bacon, but use it at Fry's where it is 50% off this week! They are advertising their Honesuckle White Premium Turkey at 0.39/lb! They are also advertising a 10 lb. bag of Russet Potatoes for 1.47! (limit 2) You can price match this at Wal-Mart as well. - Honeysuckle Turkey Frozen Grade A .79lb with minimum $25 purchase - first ? DirtDevil just posted a 2008 Guide to Online Shopping Shortcuts. It has a great list of daily deal sites. It also has some neat tricks for finding promo codes. The guide is free and it can be downloaded as a pdf. It is only 10 pages long, and is full of great information! Go HERE to their special offer page, and click on the very last offer at the bottom of the page. Hobby Lobby is one of my favorite stores ever! They always have great deals, discounts and clearance sales. Their home decor and holiday decor is always adorable. If you don't get a flyer in the mail, you can always go online and print off a coupon each week for their store. The current one expires 11/22. You can print off as many as you want, but you can only use one per transaction. Click HERE to print your own! 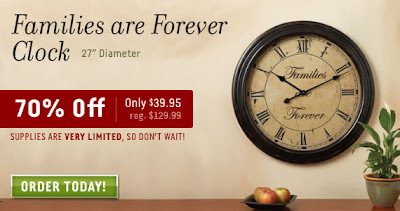 Families are Forever Clock offered by Deseret Book for only $39.95!! Regularly $129.99. 70% off!! Click the pic for more info! I'm so ordering one of these RIGHT now! Merry Christmas to me! Accept all Competitor Coupons from Albertsons, Bashas, Safeway, Fresh & Easy, Walmart Neighborhood Market, Walmart Marketside, Sunflower Market, Sprouts, Whole Foods, AJ's, Trader Joes, Food City and Ranch Market. Competitor Coupons will be accepted on identical items, no substitutions. Limit one manufacturer and one competitor coupon per item. Value of coupons cannot exceed cost of item. Extended thru 12/30/08. Nov 19th-21st from 4-7pm, Nov 22nd-23rd from 10am-7pm, Nov 24th-25th from 4-7pm and Nov 26th from 10am-7pm. Close at 4pm on Thanksgiving Day. Re-open Friday Nov 28th at 6am. Close at 4pm on Thanksgiving Day. Re-open Friday Nov 28th at 6am. * Cook's Spiral Sliced Ham $1.55 lb. Once again, another Fresh & Easy coupon to use at Fry's! Click HERE to print off your $6/$30 coupon. Print as many as you like, just use one per transaction. There were a few more pretty good coupons that I saw that will be great with the quadruple coupons, and save your Safeway ad that had coupons as well. Fry's will take the $3/3Q for Poptarts and we have a coupon for .55/1 that came a week or two ago for those as well. Print off a $5/$20 coupon from Walgreens to use at Fry's by clicking HERE. Coupon is good Friday and Saturday only. Print as many as you want, just use one per transaction. Fry's has cream cheese 4 for $5.00. Use the coupon from Albertson's ad BOG2 Free, you get: 3 for $1.25. Final: Free (after quad coupons) If you still have some, these expire TOMORROW, so go use them! Walgreens $5.00 coupon good Fri/Sat Only! Save 70% at Restaurant.com with the code DESSERT. Pay only $3 for a $25 certificate. These make great gifts and don't expire for a full year. For part of "Oprah's Clean Up Your Messy House Tour," Snapfish is offering a free 8"x11" custom cover photo book. I haven't tried it yet, but plan to. Go here and follow the link to Snapfish. Limit one per household and the offer does not include shipping and handling or extra pages. You have to sign up for this by Friday and redeem it by Sunday for it to work. Have fun, and the first one to try it, let us know how it went! Fry's 11/12 thru 11/18 Quadruple coupons!!! Fry's QUADRUPLED my coupons today! Fry's is still honoring competitor's coupons as well as doubling/tripling/quadrupling coupons through 12/30. Exclusively Online, Bath & Body Works is having a 20% off sale. Enter promo code: 20friends at checkout. * Triple Coupons up to 33¢ and double coupons up to 50¢. Limit 3 of same coupon per customer per transaction. Accept all Competitor Coupons from Fry's, Safeway, Bashas', Fresh & Easy, Walmart Neighborhood Market, Walmart Marketside, Sunflower, Sprouts, Whole Foods, AJ's, Trader Joe, Food City and Ranch Market. It's a great way to use up your powdered milk from your year supply! 1 1/2 - 2 cups ICE water- really, really cold. Place ALL the ingredients in the blender, including the oil. Use less water for a thicker milkshake or more for a shake that’s easier on your blender motor. With lid on, process for two minutes. If you haven't visited it already, my blog is geared up for beginners, lots of great info if you're still getting the hang of reading coupon codes, learning the rules of the stores, where to find the coupons, etc. Please check it out! And be sure to change it on your favorites & let me know if you have any questions! $2.00= Highest value of coupon BEFORE doubling, if doubling exceeds price of item, then the coupon will be doubled to the item price (No overage). New $6 off $30 Fresh & Easy coupon to use at Fry's! $6 off 30, print as many as you need, use one per transaction at Fry's. expires Nov. 16. First off, who wouldn't want this tote? Send in 5 used (and clean) Target plastic bags in any 8½ x11" or larger envelope. Be sure to affix postage and include your return address. Just take the coupon to any Target store to get your tote! One tote per household. Betty Crocker Frosting OR Brownies $.99 . In yesterday's paper, on page A13, Bashas's ad says that they will double all coupons up to a $1. Ex: $1 coupon will double to $2, $.75 will double to $1.50, etc. Anything more than $1 will be redeemed at face value. Maybe there are some good deals to be made before Tuesday. I don't usually shop Bashas' because they are much too strict on their coupon policies and procedures, but if anyone comes up with good scenarios, let us know! Paying for prescriptions stinks. We spend around $150.00 a month on 5 medications for my two girls. (That's with insurance!) Both of my girls have asthma and one of the medications they are both on is Singulair. Between getting my $25.00 transfer credits (one per prescription) at Fry's (they accept competitor pharmacy coupons), the $10.00 coupons and both $20.00 coupons, I am a happy mom this month! Does anyone else have any good prescription coupons like this? I have heard that Costco is unbeatable in their Rx prices. (with or without insurance) Does anyone use them? List of participating prescriptions is HERE I had never looked at it before today, but there are several Rx that we get or have gotten prescriptions for that are cheaper at Wal-Mart than through our insurance. You can print off the list and keep it with you for when you go to the Dr. and request a generic of specific drugs that you know are on the Wal-Mart list. Remember that CVS, Target, Fry's (accepts competitor Rx coupons), Walgreens etc. all send out coupons for new and or transferred prescriptions from time to time. Watch for them. It is worth it to transfer an $8.00 prescription to CVS if they are going to give you a $25 gift card. Even if your prescription is $30, you still basically only spent $25.00 on it. You can only use one transfer coupon per drug store per prescription. So, once you are all "transferred out", you can either leave it where it is or transfer it back to your "favorite drug store". All you have to do is guess the first Christmas song that they will play this year. (They give you a list of 10 to choose from) Who doesn't want $5,000? Go HERE to register (very easy) and take your guess! Remember, you can register once per day. If you hadn't heard the rumors yet, it is true. Mervyns filed for bankruptcy in July, and although they tried to keep open on a smaller scale, they can't do it and are closing ALL OF THEIR STORES! Their going out of business sale has already started, and everything in the store is at least 50% off. Hopefully someone can find some killer deals on things they need there! Happy Holidays! My cousin, Brenda posted her laundry detergent "recipe" on her blog, and I thought I would share. It is such a money saver! Maybe I will get brave enough to try it some day soon! You can find all this stuff at your local grocery store. The Fels Naptha soap and borax are in the laundry isle, the washing soda in the dishwashing isle and ivory soap in the bath isle. Fels Naptha is the BEST spot remover I have ever found. To pre-spot my clothes I wet the stain, and then rub the soap over it. I let it sit for at least 1/2 hour or more for better results. Fels Naptha soap has a distinct smell to it and I found that adding the Ivory soap tempers that smell. Chop both bars of soap to smaller pieces and place in a pot with 5 Cups of water. Heat pot to just below boiling, stirring slowly with a wire wisk, until all the soap is dissolved. (This is the longest part of the whole process.) **Boiling will cause the liquid soap to foam.Fill a 5 Gallon bucket with 3 Gallons of hot water.Add one cup each, one at a time, of the borax and washing soda and stir until each is dissolved.Add the liquid soap mixture and stir.Let the container sit until it is cool, mixing it occasionally, and then put into containers. I have a large capacity washer and hard water and I use a heaping cup, as shown. It takes a bit of trial and error to figure out how much to use in your own machine. This is a low sudsing detergent so it can be used in front-end loading washers, but you probably do not need to use as much. Fill your storage containers leaving about four inches at the top. The detergent will solidify a bit and you need room to shake it up so that you can pour it out. This bottle shows the maximum amount you should fill the container. It is not as fragrant as many laundry detergents so if you want more fragrance, you can buy your favorite liquid fabric softener and add it to the rinse cycle. Thanks, Brenda! Does anyone else make their own soaps, cleaners etc? Someday I will get BRAVE (or smart) like you ladies! $6 off $30, print as many as you need, use one per transaction at Fry's. expires Nov. 16. Remember, Fry's is now tripling coupons! Coupons up to 50¢ will double up to $1.00. They will also accept all Competitor Coupons from Albertsons, Bashas, Safeway, Fresh & Easy, Walmart Neighborhood Market, Walmart Marketside, Sunflower Market, Sprouts, Whole Foods, AJ's, Trader Joes, Food City and Ranch Market. Competitor Coupons will be accepted on identical items, no substitutions. Limit one manufacturer and one competitor coupon per item. Value of coupons cannot exceed cost of item. Extended thru 12/2/08. There are more items in the ad, so check it out! Thanks, PYP for some of this info! Don't forget that you can always purchase coupons on Ebay for items that you can get for Free/nearly free. All for less than $8.00 including shipping, and my savings will be in the hundreds. Buying coupons on eBay has several advantages. First, someone else is spending their time gathering the papers, clipping and sorting the coupons, and mailing them to you. You don't have to do all of the work! ime saver! And you should get those coupons within 2-3 days. Score! If you live in the East Valley and you need to do some "fall cleaning", or you love to shop yard sales we have the perfect event for you! DIRECTIONS: If you are coming from the US60, Exit SOUTH on Ironwood, drive about 1o miles. Turn LEFT on Ocotillo (East). A mile or two down the road is the church building on the right. Just follow the signs! 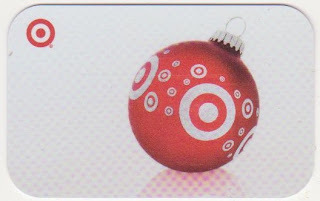 Target toy catalog coupons are available here for your holiday shopping. The coupons expire on 11-26-08. What can you get with your "I Voted Today" Sticker? There are places that will give you FREE stuff if you show your "I voted today" sticker. Starbucks will give you a FREE cup of coffee. Krispy Kreme will give you a FREE very patriotic star shaped doughnut with red, white & blue sprinkles. Chick-Fil-A will give you a FREE Chicken Sandwich. Ben & Jerry's will give you a FREE scoop of ice cream between 5-8pm. I love Ben....and Jerry. All offers are good only on 11/4! 2- Head back to the pharmacy and ask them about their Walgreens savings plan. You are interested in getting the $50 worth of Walgreens coupons. It has a red cover and is a thicker paper folded in half. When you get it, don't tear the coupon out. It is on the bottom row of coupons. 3- The limit on diaper is 4 per transaction. If they don't have them in stock, get a raincheck. The Walgreens coupon is good until 12/31. 5- It ends up being 2 packs of diapers for $4.99. If Walgreens does have a coupon come out next Friday/Saturday it will work out even better. 6- Some people are reporting that the training pants are not scanning with the Walgreens diaper coupon. It should be though. If this is the case, it will depend on the cashier if they will accept it or not. Also they may only do it one time since that is the limit on the coupon. SuperTarget is offering 1lb Green Giant baby carrots for $1 a bag this week. I'm not due for a couple of more months now, (my excuse for being MIA lately) but I can't help but walk down the baby isle just trying to find bargains for baby stuff anyways. I am glad that I did!